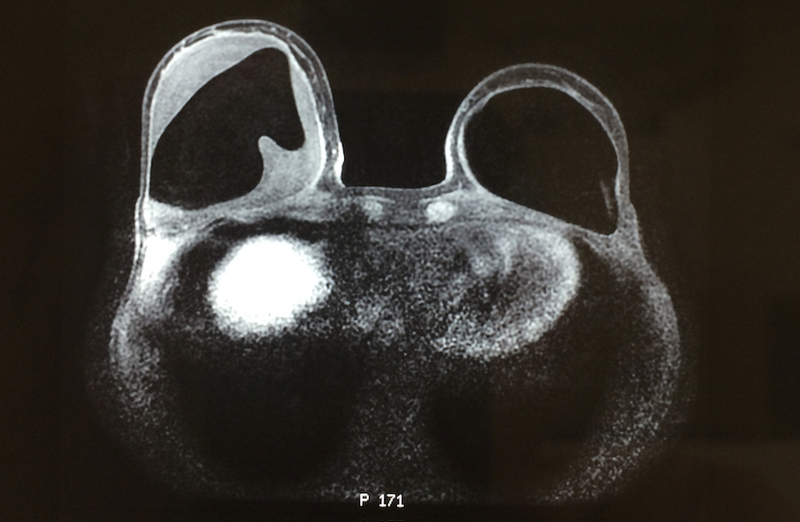 Only recently described, breast implant–associated anaplastic large cell lymphoma (ALCL) usually presents as an effusion-associated fibrous capsule surrounding the implant and less frequently as a mass. Little is known about the natural history and long-term outcomes of such disease. It is estimated that between 5 and 10 million women have breast implants. Due to the rarity of a diagnosis of ALCL (3 in 100 million per year in the USA diagnosed with ALCL in the breast) a worldwide collaboration is required to provide robust data to investigate this possible link. ALCL is a lymphoma and not cancer of the breast tissue. When breast implants are placed in the body, they are inserted behind the breast tissue or under the chest muscle. Over time, a fibrous scar called a capsule develops around the implant, separating it from the rest of the breast. In women with breast implants, the ALCL was generally found adjacent to the implant itself and contained within the fibrous capsule. ALCL is a lymphoma which is a type of cancer involving cells of the immune system. It is not cancer of the breast tissue. In a study reported in the Journal of Clinical Oncology, Roberto N. Miranda, MD, Associate Professor in the Department of Hematopathology at The University of Texas MD Anderson Cancer Center, and colleagues assessed disease characteristics, treatment, and outcomes in 60 cases. They found that outcomes are better in women with effusion confined by the fibrous capsule, whereas disease presenting as a mass has a more aggressive clinical course.Patients should be advised that ALCL is a very rare condition and until any further evidence is presented there is no need to remove breast implants as a matter of course. These data suggest that there are two patient subsets. Most patients who present with an effusion around the implant, without a tumour mass, achieve complete remission and excellent disease-free survival. A smaller subset of patients presents with a tumour mass associated with the fibrous capsule and are more likely to have clinically aggressive disease. We suggest that patients without a mass may benefit from a conservative therapeutic approach, perhaps removal of the implant with capsulectomy alone, whereas patients with a tumour mass may need removal of the implants and systemic therapy that still needs to be defined. We continue to advise that any women with breast implants who experience any sudden unexplained changes, lumps or swelling should speak to their GP or their surgeon. Breast Augmentation revisions: 3 facts you must know! Designing a surgical plan that can deliver a satisfactory result for women seeking surgical revision after breast augmentation can be quite diﬃcult. It still requires the plastic surgeon to obtain a good history, perform a careful clinical examination and identify the woman’s concerns and goals. Revisional surgery after breast augmentation is typically more complex, because of the diversity of presentations and the interval elapsed since their primary surgery. Additional surgery may be required because of anatomical changes caused by the previous procedure or that have occurred over me. This information must be explained to and understood by women who may be expecting an easy ﬁx. Furthermore, plastic surgeons may face the challenge of communicating with a dissatisﬁed and angry patient and therefore, in-depth and honest discussions outlining the risks, beneﬁts, and costs of the various options remain paramount for achieving success. 1) Your plastic surgeon needs to listen carefully to what you’re saying. They must ﬁnd out what’s motivating you in order to satisfy your goals. If your problem, however, is imperceptible to them, or you’re seeking an outcome they consider unattainable, they may not be able to help you reach your goals. 2) Use visuals to enhance your consultation. Visuals are extremely useful in helping you to understand all your options. Your plastic surgeon should draw schematic diagrams to explain the various techniques and present you with lots of pictures of previous patients, which should be catalogued by physical attributes, rather than by implant volume or bra size. 3) Make sure all your options are given to you in detail. Your plastic surgeon should take a systematic approach to counseling you about your surgical options, beginning by describing the simplest, least-expensive procedure and moving up in terms of complexity and cost. Outlining all of the information so that you understand the basis for your recommendations and the likely outcomes should help you reach an informed decision and choose an operation that will deliver a satisfactory result. If you have cost in mind and are dissatisﬁed after your recent primary surgery, then try and rectify the situation by returning to your previous surgeon. If this is not an option because of poor surgeon-patient communication, then you should seek another surgeon.